After the election on Monday, the right wing Progress Party (FrP) has got change to enter in the new government for the first time in its history. Before the election, FrP’s two deputy leaders, Per Sandberg and Ketil Solvik Olsen demanded that Jensen must be finance minister in the government. 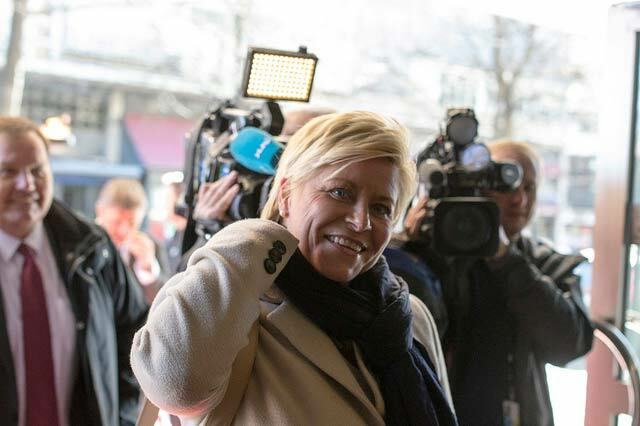 But Norwegians are skeptical of the party leader Siv Jensen (44) as Finance Minister. According to a poll by Norwegian daily VG, only one in four respondents believe FRP leader will work “well” or “very good” in the role of finance minister. 45.5 percent said they believe she will perform “bad” or “very poor”, while almost 15 percent answered in the middle of the scale. However, some economists think the rest of the government parties will keep her on the track. – The government’s overall policy will guide Jensen, if she becomes finance minister. Also the Ministry of Finance’s powerful bureaucracy set clear guidelines, says Chief Economist at DNB Markets, Øystein Dørum. He also thinks that FRP will not be able to get approval for a sharp increase in oil spending as opposed to what the party promised before the elections. The three other parties are against more oil money spending in the budget, notes Dørum. He states that fiscal policy must and will be based on the Government’s overall policy. The Minister of Finance shall maintain integrity and must be able to fit into this policy with the rest of the government and the public. Harald Magnus Andreassen, chief economist at Swedbank First Securities, is not either afraid of Jensen as finance minister. – She is not finance minister for a majority FRP government. Had she been there, I would have been more upset, says he. Conservative Party leader Erna Solberg has said to VG that she will keep budgets within the guidelines. How the economy is affected by a new policy therefore depends on how big an impact FRP gets in the government. Siv Jensen however did not comment on VG’s poll. – I have no comment on any ministerial posts and positions. FRP is keen to implement most of its policies, Jensen writes in an e-mail to the newspaper.